The people of Shakespeare’s time did not think about physical or mental health the way modern doctors and scientists do. Just as we now believe that mental illnesses may in part be due to an imbalance of chemicals in the brain, Elizabethan doctors similarly believed that certain personality traits stemmed from an excess of specific fluids in the body: black bile, yellow bile, phlegm, and blood. This idea was called Humorism, and claimed that the excess of any of these four fluids would produce one of what was known as the four temperaments, each connected to a different element. An excess of blood created the Sanguine (associated with air) temperament, which was considered the most desirable temperament. Sanguine people were fully functioning members of society–they were enthusiastic, active, and social. The Choleric (fire) temperament was associated with aggressive behavior due to an excess of yellow bile in the body. The Phlegmatic (water) temperament was associated with apathetic behavior, or a lack of feeling, due to an excess of phlegm in the patient’s body. The Melancholic (earth) temperament’s excess of black bile was thought to cause what we would now call depression. How does all this relate to Hamlet? The melancholic humor is often used to describe Prince Hamlet’s temperament. During Shakespeare’s time, it was also thought that people with an imbalance in one of the four fluids, especially those people who were melancholic or choleric, were some of the most vulnerable to the wills of wicked spirits who might use them as means to evil ends…which explains Hamlet and his friends’ hesitation about whether or not to trust the Ghost of the dead King! 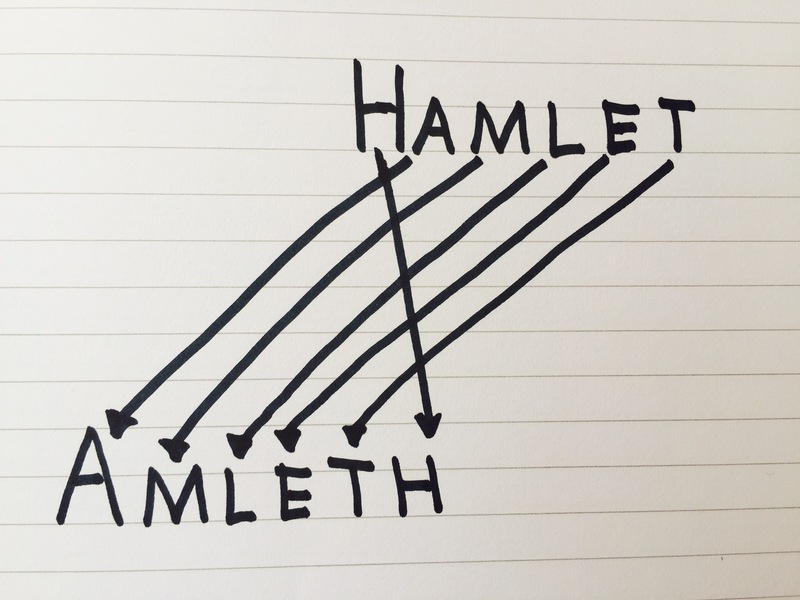 Shakespeare’s Hamlet has become a story for the ages. The play, written sometime between 1599 and 1601, has been produced thousands of times on stage and has been adapted into countless musicals, films, ballets, and more over the past four centuries. That being said, the story behind Shakespeare’s Hamlet has been around for far longer than the play, predating it by more than 500 years! The story of Hamlet originally appeared in an ancient Scandinavian folk tale which was passed down by word of mouth for generations. The first known physical copy of the story, however, was written in the 12th century: Danish historian Saxo Grammaticus transcribed the tale of the Prince known as Amleth (not Hamlet). He published the story in the third and fourth volumes of his larger 16-volume record of Danish history. This Gesta Danorum (“Deeds of the Danes”) tells of the rise and fall of the great Danish rulers. The exact dates of publication are widely disputed, but it is generally agreed upon that the last volume was produced in the year 1208. “King Rørik of Denmark appoints the two brothers, Horwendil and Fengo, as rulers of Jutland (also known as the Cimbrian Peninsula of Denmark/Germany). Horwendil slays the King of Norway, marries King Rørik’s daughter Gerutha, and they have a son named Amleth. Consumed by envy of his brother, Fengo murders Horwendil and marries his wife Gerutha. Amleth then feigns madness, clothing himself in rags and spouting nonsense, to shield himself from his uncle’s violence. In fact the name “Amleth” comes from the Icelandic Amlóði, meaning “fool” or “simpleton”. “However, Amleth’s behavior is met with suspicion, and the King attempts to trap him into admitting he has plans for revenge. First, a beautiful woman is used to lure him into betraying himself, but she proves loyal to Amleth. Then a spy is planted to eavesdrop on Amleth’s conversation with his mother, in which she repents and he confesses his plans for revenge. Amleth discovers the spy, kills him in a mad frenzy, throws his mutilated body in a sewer, and leaves it to be eaten by pigs. Fengo then deports Amleth to England with two escorts carrying a letter directing the King there to execute him. Amleth switches the letter with another one, which orders the death of the escorts and asks for the hand of the English Princess in marriage. a hero who returns home during a funeral and finally achieves his revenge through an exchange of swords. Scholars have debated how Shakespeare encountered the story. It is unlikely that he saw Grammaticus’ latin version firsthand (as it was not translated into English for centuries after he wrote his play), but he may have read a French adaptation in François de Belleforest’s Histoires tragiques (or Tragic Histories), first printed in the early 1570’s. Belleforest embellished Grammaticus’ text substantially, almost doubling its length, and introduced the hero’s characteristic melancholy. The story itself was fairly accurate to its latin predecessor. The main difference was the names: in this version the old King is named Horvendile, his wife is Geruth, his brother is Fengon and his son, Hamlet. Nonetheless, it is still doubtful that Shakespeare ever actually read Belleforest’s text, which also had not yet been translated into English. The most probable source that inspired Shakespeare’s story was in fact another play about the Danish prince, performed in England right around the turn of the century. We have evidence that there was some form of the Hamlet story on stage at some time before 1589; in that year, playwright Thomas Nashe made reference to Hamlet in a preface for another man’s novel. Although Nashe was fond of obscure literature, it seems this play definitely existed and was popular between 1589 and 1596. Scholars speculate that the play was written by Thomas Kyd, one of Shakespeare’s contemporaries; however, the play itself has been lost. As there is no surviving copy of this “Ur-Hamlet” (as it has come to be known), scholars know very little about it except what they’ve learned from references to it (such as Nashe’s) by other Elizabethan writers. From others such as Nashe, we can put together that it in this lost version some important elements, such as the ghost of old Hamlet, were first introduced to the story. We do know that Shakespeare soon took an unremarkable revenge tale and made it resonate with the most fundamental themes and problems of his time. He changed the emphasis of the story entirely, making his Hamlet a philosophically-minded prince who delays taking action because his knowledge of his uncle’s crime is so uncertain (unlike in earlier versions, in which he had no doubt of his uncle’s guilt). Shakespeare’s Hamlet became a young student, with all the ideals of the Renaissance and humanist movements that were sweeping England, who was put in an impossible situation. And it’s a story that still has the ability to resonate with audiences today. Which Shakespeare roles have the 2017 Tony-nominated actors played? Denis Arndt as King Lear at Kansas City Repertory Company. Chris Cooper as Antonio in Julie Taymor’s 2010 film The Tempest. Corey Hawkins as Tybalt in Romeo and Juliet on Broadway. Kevin Kline as Bottom in the 1999 film version of A Midsummer Night’s Dream. Jefferson Mays as The Duke in Measure for Measure on Broadway. Cate Blanchett as Richard II for the Sydney Stage Company. Jennifer Ehle as Lady Macbeth at the Public Theater. John Douglas Thompson as Richard III for Shakespeare & Company. Nominees Condola Rashad AND Jayne Houdyshell as Juliet and the Nurse in Romeo and Juliet on Broadway. Cynthia Nixon as Juliet for New York Shakespeare Festival in 1988. So what’s missing from this list? Did we leave out any Shakespearean performances from the other nominees that you know about? Be sure to let us know! And no matter who wins tonight, let’s celebrate a group of actors at the top of their craft.